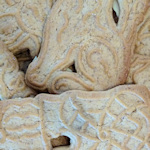 A Spekulatius is a special form of flat, slightly-browned, rectangular biscuit or cookie that typically appears in Viennese shops in great numbers during the Christmas period. The Spekulatius is not really considered a Christmas biscuit or Weihnachtskekse as such, but it is a biscuit associated with the Christmas season (I’m not going to try and explain that). The spices that are usually – but not always – present, giving the Spekulatius a slightly unusual flavour (cinnamon, cardamom, cloves and nutmeg are among the more popular alternatives). The biscuit’s surface is normally a picture of some sort, stamped into the dough before baking. Traditionally, these would be scenes from the story of St. Nicklaus (hence the Christmas association). But nowadays it’s jut as likely to be a farmhouse or tree. There’s commonly a hole somewhere in the biscuit, often as an integral part of the picture illustrated on the surface. The Spekulatius isn’t an Austrian specialty: the Dutch, Belgians and Germans also make it. Here in Vienna, the nut version is particularly popular, where the back of the biscuit is covered in slices of almonds. There’s also a butter version, which contains more…um…butter. Give them a try, because the flavour is really quite distinctive. But I wouldn’t recommend them as gifts. They’re quite brittle and fragile, as the dough doesn’t rise much. So they might not survive the journey home in one piece.